The turn of the nineteenth century marked a rich and exciting explosion of philosophical energy and talent. The enormity of the revolution set off in philosophy by Immanuel Kant was comparable, by Kant's own estimation, with the Copernican Revolution that ended the Middle Ages. The movement he set in motion, the fast-moving and often cantankerous dialectic of `German Idealism', inspired some of the most creative philosophers in modern times: including G.W.F. Hegel and Arthur Schopenhauer as well as those who reacted against Kant - Marx and Kierkegaard, for example. 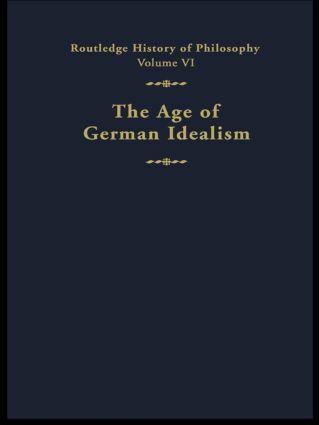 This volume traces the emergence of German Idealism from Kant and his predecessors through the first half of the nineteenth century, ending with the irrationalism of Kierkegaard. It provides a broad, scholarly introduction to this period for students of philosophy and related disciplines, as well as some original interpretations of these authors. Each chapter is written by a distinguished scholar in the field. A glossary of technical terms together with a chronological table of philosophical, scientific and other important cultural events are provided. Robert C. Solomon is Quincy Lee Centennial Professor of Philosophy at the University of Texas, Austin. Kathleen M. Higgins is Associate Professor of Philosophy at the University of Texas, Austin.